Whether you are just starting out or an established professional, landing a good job is the dream of many career-driven people. Unfortunately, the demand for these plum positions id much greater than the supply. Most times, the only way to land one – or even know that an opening exists – is by being proactive. That’s where sending cold email to recruiter comes in. 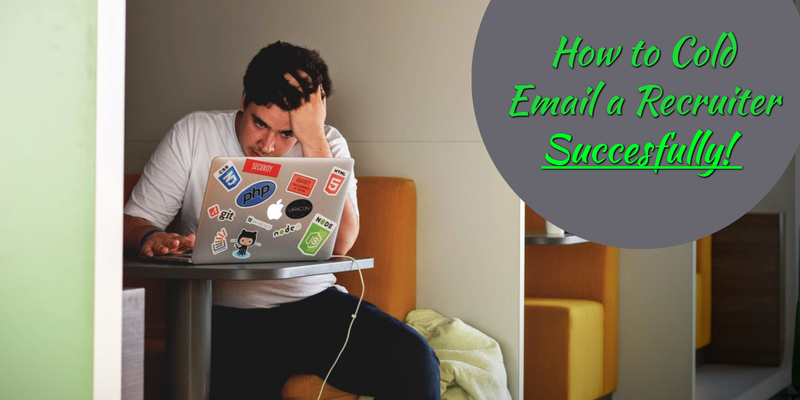 If the thought of cold emailing for jobs scares you, then you are not alone. It might seem a little intimidating or even pushy, but you should never shy away from any chance to pitch yourself to a company. This is especially true if you know that you would be a great fit. Instead, look at cold emails as you would a networking event. Of course, your first step when looking for a new job would be to take advantage of your current network. But there will always be companies that your network doesn’t cover. That’s why there is nothing wrong with going up to someone and introducing yourself, especially if that’s what it takes to land your dream job. Generally, any cold email for a job or internship is sent with one goal. That goal is to land a meeting with an influential person at the company you want to work for. This is because, with their help, such people can show you how to get your foot in the door. On the other hand, it is also important to keep in mind that such cold emails are usually quite tricky. To pull them off successfully, you have to first figure out the best person to reach out to. Then, you will need to write a message that is sure to get that person to respond. Either way, the most important thing to get right is the introduction. First impressions matter a lot, especially when it comes to the professional world. And that is why it is vital to know what makes a cold email work, and what doesn’t. When it comes to the job search, you can use cold emails to show your interest in a certain company or position. Some people have the benefit of scoring an introduction through mutual contacts, but most of us have to rely on very cold emails to get the job done. This involves reaching out to people you don’t know. As a result, this kind of email will always face challenges. But it has also been proved to be very effective when you want to expand your professional network. Some believe that this is the only time that you should send out a cold email. But that is not necessarily true. On the other hand, the recruiters you are reaching out to are total strangers who don’t owe you anything. You shouldn’t take it upon yourself to flood their inboxes with email requests for a meeting. So, exactly when and how should you use cold emailing? Our recommendation is that you use it in a very specific way: to show your interest in a company or job that you are qualified for and passionate about. All you have to do is keep in mind the do’s and don’ts of effective cold emailing to improve your chances of success. You might be very passionate about working for a particular company. But don’t give in to the temptation to apply for every open role that you might have some qualifications for. If a recruiter sees your name pop up for multiple job listings, it is a clear sign that you and indecisive and don’t know what you want. Before sending out a single cold email, know which position you are going for. There may be many options that seem like a good fit for you but prioritize the ones that are better suited for your experience, education, and skill level. This will keep you from coming across as some sort of email stalker. So, you’ve sent out your first cold email to potential employer but haven’t heard back after a while. While this is certainly frustrating, what you do at this stage is very important. It can either convince the recruiter that you’d be a great addition to the team or push them away fro good. It’s okay to follow up with one or two professional emails in the days after your initial cold email. But bombarding the recruiter with tons of emails, phone calls, and even posts on their social media channels is taking things a little too far. Apart from that, begging for a meeting or job is not going to make a great first impression on the recruiter. It doesn’t show that you are the kind of informed and professional candidate that they’d want in their company. Needless to say, if you don’t hear back from a potential employer after an appropriate number of follow up emails, you should move on to other opportunities. But if you do manage to get a meeting or follow up call, be wary of rescheduling more than once. An experienced recruiter will understand that sometimes schedules get busy and time conflicts come up. But remember that many recruiters are juggling a lot of applicants at any one time. By constantly rescheduling, you are making their job harder and giving yourself a bad reputation. This will only hurt your chances of getting the job. In this age of the Internet and fast Google searches, it is important to remember that recruiters will check up on you. You might craft the best cold email that compels them to give you a chance, but if your resume and online profiles are poorly defined, the recruiter will quickly lose interest. First, you should tailor your resume for every job you apply for. Many people have just one resume that is just a general document showing all the qualifications they have and jobs they’ve worked. Instead, your resume should tell recruiters why you’d be a good fit for a specific role. Second, your profile on LinkedIn must tell an interesting story showing why you are the perfect candidate for a particular job. It should mirror your resume and give more details on projects that you’ve worked on, professional groups that you’re a member of, and articles you’ve worked on or been featured in. You also have to keep in mind that most recruiters today look at candidates’ social media channels before considering them for any position. If you’re in the habit of badmouthing former colleagues or bashing employer’s online, this will be a major deal breaker for many hiring managers. Instead of airing such dirty laundry in public, keep any critiques on social media fair and professional. On the other hand, applications that feature incomplete or incorrect information will scare recruiters off. When a recruiter receives any cold email, they will go through everything you attach to judge if you’re an ideal candidate to get back to. If they find anything fishy with your application, they will be turned off it immediately. Your main goal is to make a great first impression. To do this, not only do you have to craft a killer cold email, but you also you’re an informed, engaged, and well-researched candidate. It is also a good idea to make the recruiter’s job easier. Do so by including every important bit of information, including a full list of references, a portfolio that is easily accessible, and any relevant work samples. You might send out a cold email that gets you that all-important follow up call or meeting, but how you perform here is just as important. Any inconsistencies here will be a huge red flag for the recruiter. It is a clear signal that you’ll also be an unreliable employee, which is not what you want any hiring manager thinking about you. So, spend time writing a cold email that will open the door for you, but make sure you can back it up in the real world. Now that you know what not to do, what exactly makes a great cold email? This is one of the most important parts of an effective cold email. Think about it: who would go out of their way to help a total stranger get a job? They’d have to be a saint to do it! So, always keep in mind that no one is going to hand you a meeting, interview, or follow up call just because you asked nicely in an email. On the other hand, people are more likely to help if they know that they’re getting something out of it. It could be something as simple as volunteering to help on a project, offering special knowledge on a certain area, or leaving a feedback for the company’s products or services. But most times, the fact that you sent a cold email when the recruiter is trying to fill a particular role is usually a godsend for them. That’s because finding the right person who fits in with the company culture and team is usually pretty hard work that takes a lot of time. And here you are – a qualified professional who already knows a lot of the company and is passionate about working there – reaching out proactively to help them solve this problem. They’re essentially getting an amazing candidate right at their doorstep! And that is usually enough to get the first audience with any savvy recruiter. You can’t just copy and paste the same cold email job inquiry sample and expect results! Simply changing the company name and calling the recruiter “Sir” or “Madam” is not enough. Taking a hurried and impersonal approach is not going to be effective. Instead, take your time personalizing the cold email. In today’s world, everyone has some sort of online presence. That means that you can easily go on platforms like LinkedIn to understand their work history, interests, or some other tidbit that will make your email more relatable. Also, people will only take the time to read something if they know that you put in effort to write it. So try very hard to ensure that you come across as thoughtful instead of generic and spammy. As with any other type of communication, there are certain rules of etiquette when it comes to cold emailing recruiters and potential employers. The most important one is to always be respectful. Never come across like the recruiter owes you anything, or that you believe you’re entitled to their time and help. Cold emailing for a job or internship is not necessarily the same as what salespeople and marketers would send. In this case, it’s all about selling your strengths and making the right first impression. That’s because, most times, you won’t get the chance for a do-over. Undoubtedly, the stakes are much higher here. If you get it wrong the first time, a recruiter will be left with an unshakeable belief that you are not the right person for the job. So your whole focus should be on making a positive impression from the very beginning. It is the only way to get a follow up call, meeting, or even an interview. After identifying the job you want to go after, start off by finding the right contact person. This could be the company’s recruiter or hiring manager. But to jump the line even more, you will need to do some digging and find the person you will be working directly under or with. LinkedIn is a great place to begin your search. Company pages usually show the people in charge of recruiting and team building. It is also a great resource to get an idea of the company’s internal hierarchy. You can also use the company’s ‘About’ or ‘Team’ pages to find the right person to contact. Then, you will need to find their email address. This may sound like an easy prospect, but getting the addresses of people you don’t know can be a little tricky. You could go back to the company website, where some list the official emails of their team members. But since this can be a bit unpredictable, it is better to use RooJet to track down a recruiter’s email address. This will give you all the email addresses that are related to a particular domain. So, once you have the prospect’s name and position, you can easily weed out their email address. It also helps to show your value proposition immediately. The only reason recruiters will reply to you is if they believe you can provide actual value if you get the job. Why should they pick you? What makes you stand out from the crowd? A great way to do this is by giving a specific example showing why you’d be a great fit. It is also vital to be as specific as possible. This will give the recipient a clear picture of who you are and exactly why you want to talk to them. Make sure to say why you’re interested in the company and list any relevant skills that make you a great fit for the job. If you’re asking yourself how to start a cold email, a captivating subject line is your best bet. It is also important to tailor the subject line for cold email job to the specific recruiter you’re contacting, as well as the company culture. Your in-depth research will come in handy here. If the company website features quirky bios for its team members, then adopting a more conversational tone will make your subject line a big hit. The goal here is to add a bit of personality to make your email stand out, but not in the wrong ways. Once the recruiter opens your cold email, they want to know what you can bring to the table that could help the company operate more efficiently and effectively. What skills or experience do you have that could convince them to trust you to join their company? Make sure that you tailor your cold email to recruiter to show your strengths. A great way to do this is by highlighting your most recent, relevant work first. The goal is to provide enough information to interest the recruiter, but not too much that they won’t read through your whole message. That’s why it’s a great idea to have a separate online portfolio showing some of the projects you have worked on. Do you want to write a cold email that recruiters will actually respond to? Then keep your ask small! If they feel like they’re making some huge promise by replying to your email, then they will just send it straight to the trash folder. For example, you will get more replies if you ask for something like an informational meeting than if you ask directly for a job. Ideally, the whole point of cold emailing for a job is to get the position, but this subtle approach will put the recruiter at ease and get your foot in the door. Your call to action should be something very specific, such as a request for a meeting, informational interview or follow up phone call. But you can also add a small tidbit that can make you more memorable. For example, you can show how a previous project that you executed successfully can be adapted to your target company. You could also prepare a pitch deck, white paper, or even a simple short-term business plan that shows some actionable steps that will make the company more productive. When cold emailing for a job, it is very rare to get a reply right away. If the recruiter hasn’t responded after two days – especially if they are busy people – then you can send a quick but professional follow up email. Just wanted to follow up in case you missed my last email. I know you’re an incredibly busy person, so I thought I’d give my message a little bump to the top of your pile. Would you be free for a short 10-minute call on (mention specific date and time) for a quick chat? Using templates in cold emailing is standard practice. They can even be wildly successful, especially when personalized and customized right. So if you want to work with a proven formula, a cold email for job sample is the right way to go. I wanted to share with you the (strategy/process/platform) that I had previously worked on for (name of relevant company/client). I adapted it for (name of recruiter’s company) based on what I know works from my experience in (mention relevant skill). I have a solid background in (highlight your skills/experience) and I’m looking forward to helping (name of recruiter’s company) to (mention specific benefit). Are you available for a short 15-minute chat on (mention specific date and time) to discuss this further? Sending cold emails is a great way to make sure that your resume is seen and weighed by the right people. It might be a bit intimidating, but cold emailing recruiters is a win-win proposition for you. The worst that could happen is that the prospect might ignore your message. But, on the flip side, you might end up landing your dream job and gaining a valuable contact.